CEREC® crowns have an incomparable natural look with the durability of a lifetime. Therefore it is our policy that for all our active patients a lifetime warranty* is granted with a CEREC® crown, inlay or onlay restoration. Make the correct decision when choosing your treatment. Designed to Last a Lifetime -- With 15 years of research behind this materials and our experience with it, we are so confident that we will guarantee these to last your lifetime. If the restoration breaks or fails, replacement is at no charge as long as you keep all of your 6-month checkup and cleanings on-time with us. In the case of Onlays/Inlays, if another part of the tooth breaks/decays, there will be a reduced charge to make a larger CEREC® "All Ceramic" replacement. 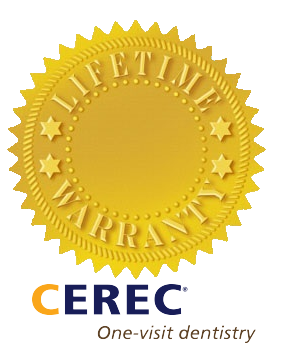 *CEREC Lifetime Warranty applies only to regular priced procedures. 6 month check ups are required for lifetime warranty to be valid. Patient must bring damaged restoration in exchange for a new one. Patient must present original invoice. Lifetime warranty only applies to failure and/or if restoration breaks, it does not apply to root exposure due to gum recession.